The New Palestine girls soccer team posted a 3-1 victory over Lawrence Central Saturday morning in their final home game of the regular season. The Dragons took a 2-0 lead in the opening half. Lucy Miller scored with a near-post shot from her outside midfield position. Maddy Miller followed with a goal before halftime. LC drew one back with a breakaway goal in the second half, but Olivia Lambdin responded with a penalty kick to seal the victory. Haley Weinrich played the first half in goal and kept the Bears off the board. Riley Moss played the second half in net. “We passed the ball extremely well today, maintaining possession for the majority of the game,” coach Gina Fannin said. While Senior Night was played earlier in the week – Saturday’s game was a make-up game – this was the final scheduled home game for the Dragons. They finished with the healthy 10 seniors on the field for the final whistle. The Dragons are now 10-4 on the season. They finish the regular season Monday at Shelbyville. 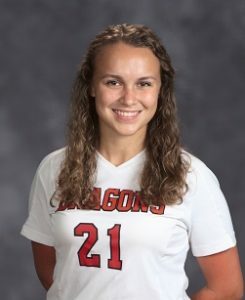 Maddy Miller scored the eventual game-winner in the Dragons’ victory.